"The Tree of Life" is the fifth feature film from visionary auteur director Terence Malick – extraordinary when one considers that his career to date has spanned nearly forty years. In a concept that has had fans and cinephiles salivating and scratching their heads in equal measure, Malick tackles the very nature of existence itself, projecting it through the microcosm of one man's difficult upbringing at the hands of his father. It features all the Malick hallmarks – an emphasis on nature; an exploration of man's place in the world; voiceover – and then we arrive at the musical score, by Alexandre Desplat. Malick has overseen some famously difficult collaborations with some of Hollywood's most noteworthy composers. His 1978 film "Days of Heaven" featured a ravishing beautiful score by Ennio Morricone, one of his very best; fast forward 20 years to 1998's "The Thin Red Line" and Malick returned to work with Hans Zimmer. As a result of a troubled editing process, Zimmer ultimately composed four hours of music to appease the director, allowing Malick to cherry-pick the music as he saw fit. Consequently, what was heard on the album release was hardly representative of Zimmer's efforts. James Horner fared worse however on 2005's "The New World", as much of his lyrical, sweeping material was replaced with classical music selections in the final cut. 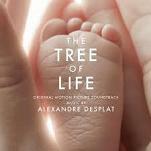 It's a similar story with "The Tree of Life", with much of Desplat's score not being used in the film. As a result, the accompanying score CD is likely to be seen as more of a concept album, featuring Desplat's musical interpretation of Malick's film as he originally intended it. This isn't to denigrate their collaboration; Desplat has been highly complementary of Malick in interviews, describing his score as a 'river', one that reflects the meandering, puzzling nature of existence as seen in the film. Desplat's challenging score showcases the composer at his most uncompromisingly intellectual. A rising star, Desplat has quickly established himself as one of the most refreshing and multi-faceted musicians on the film scoring circuit, equally adept at fantasy ("Harry Potter"), thrillers ("The Ghost Writer"), classy dramas ("Girl with a Pearl Earring") and European cinema ("Un Prophete"). His ornate, classical style, full of bubbling woodwinds and lively strings, has so far been put to excellent use in a variety of genres, and now he puts it to use on Malick's film. To put it bluntly, "The Tree of Life" isn't the composer at his most accessible but this isn't so much a score that requires repeat listening as demands it. Persevere and one uncovers remarkable rewards: this is an extraordinarily adept piece of musical storytelling, supple and subtle, and one which brilliantly embodies the qualities of a river, as the composer intended. The deceptively anonymous textures are in fact full of little nuances, which reflect the eddy's and currents in the lives of Malick's on-screen protagonists. Unlike his more popular scores, Desplat avoids a large, overwhelming soundscape. He keeps it stripped down and minimalistic, inevitably calling to mind the likes of Phillip Glass, although Desplat's musical voice is immediately recognisable. Attempting to describe the score on a track by track basis is much of a muchness; this is a soundtrack of mood, of melancholy and of introspection. It's full of highs and lows, which come with the interplay between various parts of the orchestra. It appears aimless but the aimlessness is itself a dramatic device, and yet there's also a sense of structure within the fluidity. Desplat's music takes us from birth to growth and beyond. Hence, "Memories of Childhood", whereby a sparse piano is laid over a bed of strings, takes us on a wistful quality, akin to the nostalgia we experience when recalling a distant event. "Awakening" and "Emergence of Life" take on the very qualities you expect, flowing and circulating and bubbling away in hypnotic fashion. At eleven minutes, the lengthy "Circles" is a journey in and of itself, showcasing Desplat's intricate style to marvellous effect; the sense of "awakening" brought across by the strings and piano is extraordinary. There are occasional whimsical sections ("Motherhood") that call to mind Desplat's more lighthearted material on other projects. The darker sections of the score, as heard in tracks such as "City of Glass" and "Temptation" are a harder sell but necessary in representing the flipside to childhood innocence, painting a musical portrait of the difficult growth to adulthood. The lack of catharsis in the climactic "Skies" will likely frustrate many listeners, the score trailing off into melancholy wispiness. Desplat is so committed to painting a musical portrait of his director's world that he's even willing to prevent the need for a satisfying climax – the lack of catharsis on-screen carries over into the music, leaving an unresolved sense of pragmatic melancholy. It's one of many tracks in which the score frustrates as much as it entices but to generate such divergent reactions is proof of how powerful a piece of work it is. "The Tree of Life" is certainly not a score to win over new fans of this extremely talented composer and it certainly requires more work than much of his recent output. However, those who seek stimulating, rich, intellectual film music will find much to admire and appreciate. In its elusive, confounding nature, "The Tree of Life" is one of the standout scores of 2011, and another triumph for the rising Frenchman. The CD album is available at these links: Amazon.co.uk or Amazon.com.